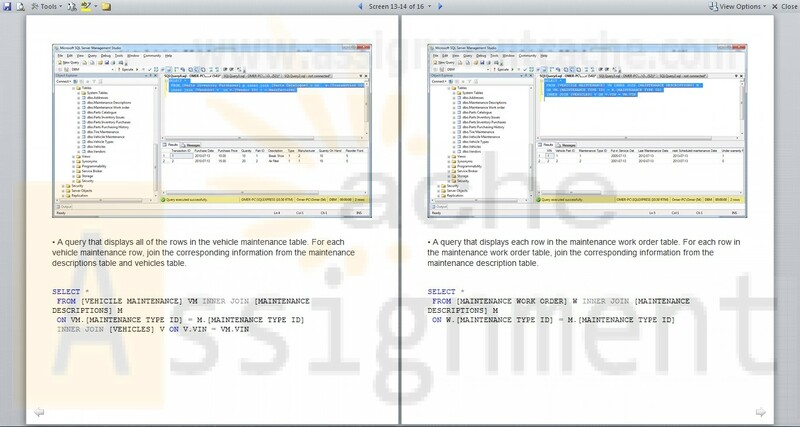 Based on your Week #2 IA’s table design metadata, program your own SQL statements using SQL Server’s Management Studio to create, populate, and query a relational database for the Huffman Trucking’s fleet truck maintenance application. (3 points) Use CREATE TABLE statements to create a table for each entity for Huffman Trucking’s fleet truck maintenance database. (2 points) Use INSERT statements to populate the tables with realistic sample data. Include at least 2 rows for each table. • A simple query for each table that returns all of the columns and all of the rows for each table. • A query that displays each part that has been purchased by Huffman Trucking Company. For each part, also retrieve its parts catalog information from the parts catalog table and vendor information from the vendor table. • A query that displays all of the rows in the vehicle maintenance table. For each vehicle maintenance row, join the corresponding information from the maintenance descriptions table and vehicles table. • A query that displays each row in the maintenance work order table. For each row in the maintenance work order table, join the corresponding information from the maintenance description table. • A query that counts the number of maintenance work orders for each vehicle in the maintenance work order table. Display the vehicle column and the corresponding count of work orders for each vehicle. (2.5 points) Create a report using the SQL Server Business Intelligence Reporting Services of the parts purchasing history for Huffman Trucking Company. 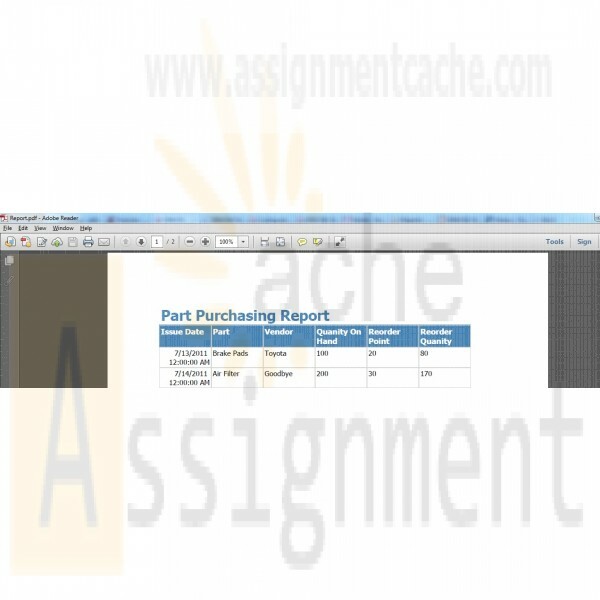 The report should display all parts purchasing history including manufacturer and vendor information, parts catalog information, and associated parts inventory issues, and all parts inventory purchases. Format the report to present to senior management at Huffman Trucking.